The World Cup winner saw the excellent work that the Town Foundation coaches were doing before having selfies and signing autographs for the youngsters who took part in the football camp. That means in the space of a week, children attending the camps have met Head Coach David Wagner and Erik Durm! You never know who else you’ll meet! 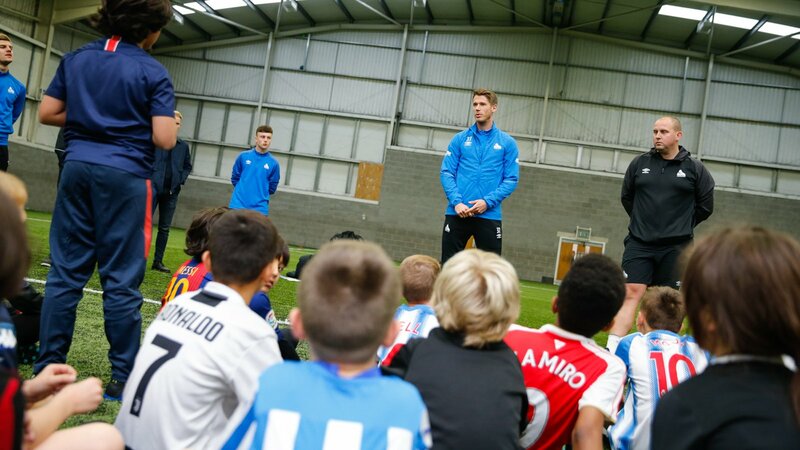 Tomorrow’s Terriers is a Football Development Programme delivered by The Huddersfield Town Foundation in partnership with Kirklees Active Leisure (KAL). The Tomorrow’s Terriers sessions are the perfect way for your child to have fun, learn new skills and keep active, as well as being part of the community. Each session consists of different skill games to improve passing, shooting and running with the ball before going into matches and tournaments. Tomorrow’s Terriers Football Camps run in all school holidays. Our next camp will take place on the 2, 3 and 4 January at Leeds Road Sports Complex from 10am – 3pm, prices start from as little as £10 per day. To book your place call KAL on 01484 766131 or visit www.kal.org.uk.